You may have a great strategy for getting to the finish line quickly, but it won�t help you much if you let other boats push you around. That�s why having good boat-on-boat tactics is so important. Tactics are the moves you make to stay in control of your race and follow your strategic plan. When you�re approaching a finish line, there are basically two tactical approaches you might take. You can either try to catch the boat(s) in front of you, or stay ahead of the boat(s) behind you (or do some combination of both). This choice depends on which boats are closer (the ones just ahead or the ones just behind), and whether of not you�re content with your position. Of the two choices you have, it�s usually harder to pass boats than to avoid being passed. So before you go on the attack, think about risk and reward. Are you willing to risk your position in order to have a chance to improve it? If your answer is yes, the basic rule of thumb for playing catch-up is to do something different than the boats you�re trying to catch. If they head for the committee boat end of the line, for example, you should go for the pin (unless the boat is obviously favoured!). When you�re getting close to the finish, you won�t usually pass boats by following. It�s too late to catch them with better speed or wait for them to make a mistake. Your best bet is to split from the boats ahead, hope for a favourable windshift or puff, and try a few high-percentage tactical moves. � Stay to the right of other boats and don�t converge with them until you have a chance to catch them in a port-starboard situation. � Look ahead and stay in lanes of clear air as you approach the finish. The best way to avoid bad air may be to avoid the middle. Watch out for the RC boat�s wind shadow. � Don�t overstand the favoured end of the line because you�ll lose distance, get tacked on, and give up your ability to shoot the line. � Finish right at the favoured end and, if it�s close, shoot it! � Keep working hard until the very end because there is always a chance to pass boats that are bunched up at the finish line. It usually pays to finish very close to the favoured end of the line (in this photo it�s the boat end on your right), but be careful when you have a committee boat there. If you cross the line too close to the boat, you may not be able to clear its bow or anchor line without tacking. Even after finishing, you can still be penalized (for touching the RC boat or fouling a competitor) until you clear both ends of the line. So when you�re in traffic, think about making a safer approach where you are sure to fetch the favoured end of the line (like the second Oppie from the right). If you�re happy with your position in the race (or if you feel it�s too risky or difficult to pass boats ahead), try to maintain your current position until the finish. The best way to stay ahead of boats behind you is to keep sailing fast and smart. As they say, a good offence is often the best defence. If you maintain boatspeed, sail to the favoured side of the course and finish at the closer end, no one will be able to pass you. However, predicting the favoured side of the course is not nearly a sure thing. That�s why the most important rule of thumb for staying ahead may be to cover, cover, cover. Don�t give the boats behind any leverage they can use to pass you if the wind shifts. Even if you know they are going the wrong way, stay with them because a) you never know for sure; and b) it won�t help to go the right way because you�ll just be farther ahead. When you�re heading for the finish, identify the boats behind you that are your biggest threats. Cover these boats by staying between them and the finish line. Better yet, stay between them and the favoured end of the line. Covering is not so difficult when the boats behind you are all going the same way. But when they start splitting up, then the fun begins! Sometimes you can use your wind shadow as a blocker to herd boats in the same direction. If this doesn�t work, one tactical option is to stay in the middle. This way no boats will get a lot of leverage on you. However, the middle is often a bad place to be, and sometimes you�ll get passed by both sides. A second option is to cover half the boats (and let the other half go). 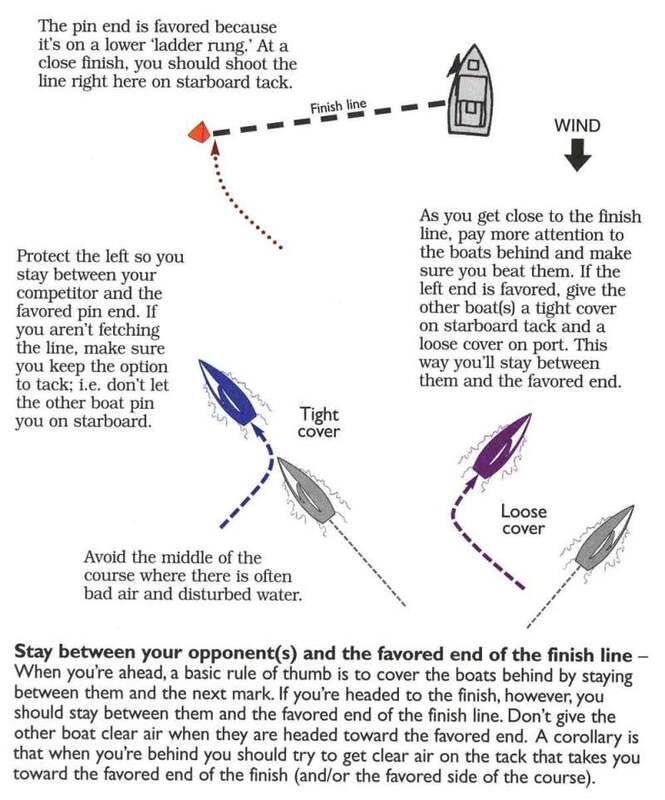 Stick with the boats that are heading toward the side of the course that you think is favoured. This way you will beat at least half the boats behind you, and if you�re good at picking the favoured side, you�ll probably beat everyone. 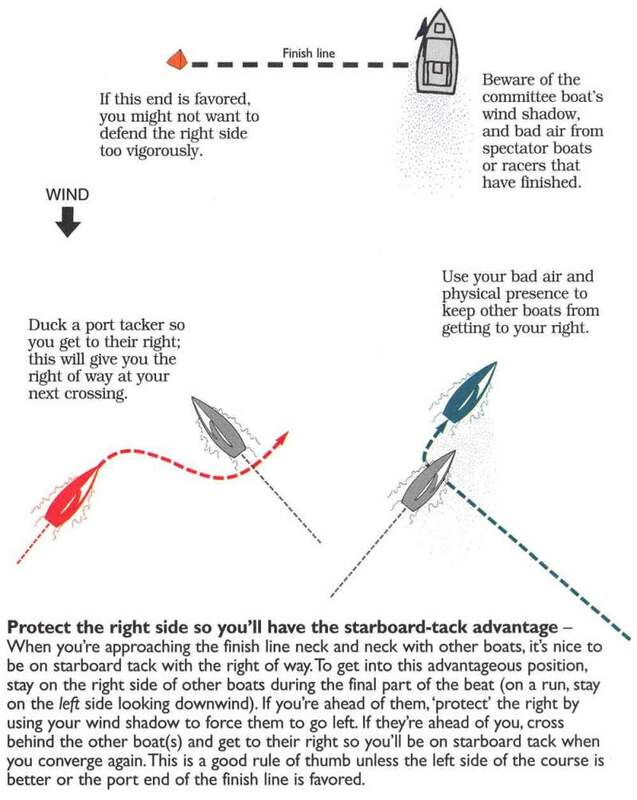 As you get close to the finish, think harder about protecting the right side so you�ll have the starboard-tack advantage when you approach the line. Set yourself up to finish at the favoured end, and be ready to shoot the line!